New Chelsea signing Gonzalo Higuain reported to his first training session on Thursday, with a little help from Jorginho along the way. As confirmed by the Blues on Wednesday night, the 31-year-old has joined them on a loan deal from Juventus, and it sets up a reunion with Maurizio Sarri following their productive stint together at Napoli. Higuain bagged 38 goals in 42 games in the most prolific campaign of his career to date under the Italian tactician in Naples, and particularly given their troubles scoring goals so far this season, Chelsea fans will undoubtedly be hopeful that the pair can strike up that successful relationship again. 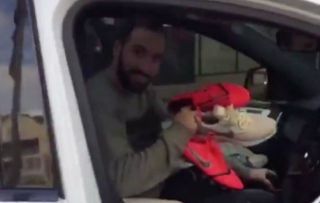 It isn’t just Sarri who will be a familiar face for the Argentine though, as he was spotted getting a lift from former teammate Jorginho on his way to his first training session on Thursday, as seen in the video below. The midfield ace will likely have a key role in helping Higuain settle and acclimatise to England and the Premier League, while their partnership on the pitch could also prove to be crucial in Chelsea’s bid for success this season.